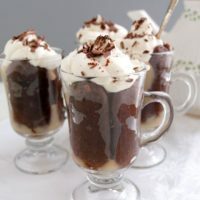 Irish Coffee Trifle is made with cocoa ladyfingers soaked with a coffee/whiskey syrup, coffee pastry cream and lightly sweetened cream on top. 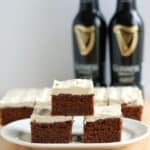 Traditionally, Irish Coffee is made with hot coffee laced with Jameson’s Irish Whiskey and a layer of lightly whipped cream floating on top. 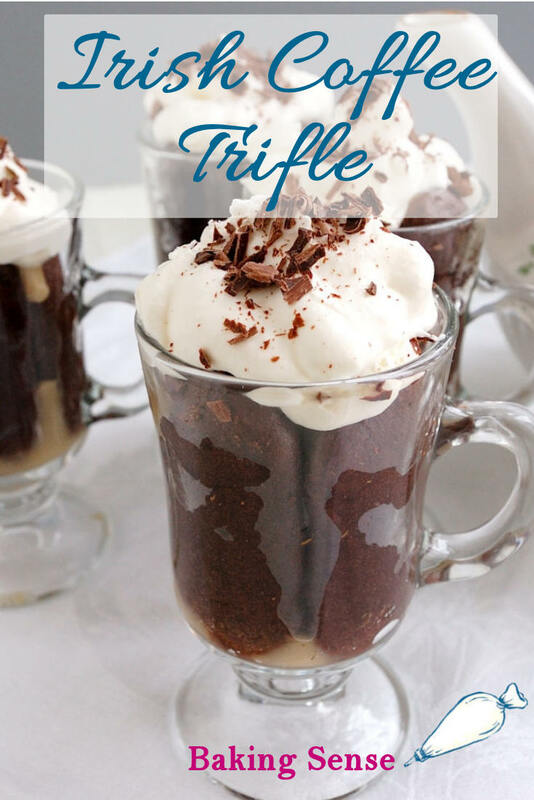 I took the flavors of Irish Coffee and turned them into a tasty trifle. The type of cake used in trifle recipes can vary. 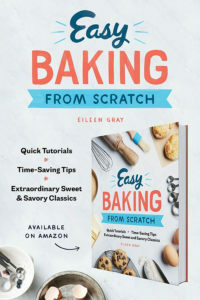 Some recipes use sponge cake, or even pound cake. I like to use the traditional ladyfinger cookies. Ladyfingers are really more of a small sponge cake than a cookie and are perfect for soaking up the flavorful syrup. 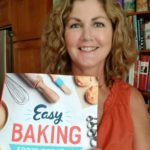 If you don’t have a piping bag you can use the trick where you cut a corner from a plastic bag or you can even carefully spoon the cookies onto the baking sheet. As long as you get the basic shape onto the sheet-pan it will be fine. Trifle always looks pretty in a glass serving dish. You can use a traditional footed trifle bowl if you have one. I used individual glass coffee mugs to play on the theme. 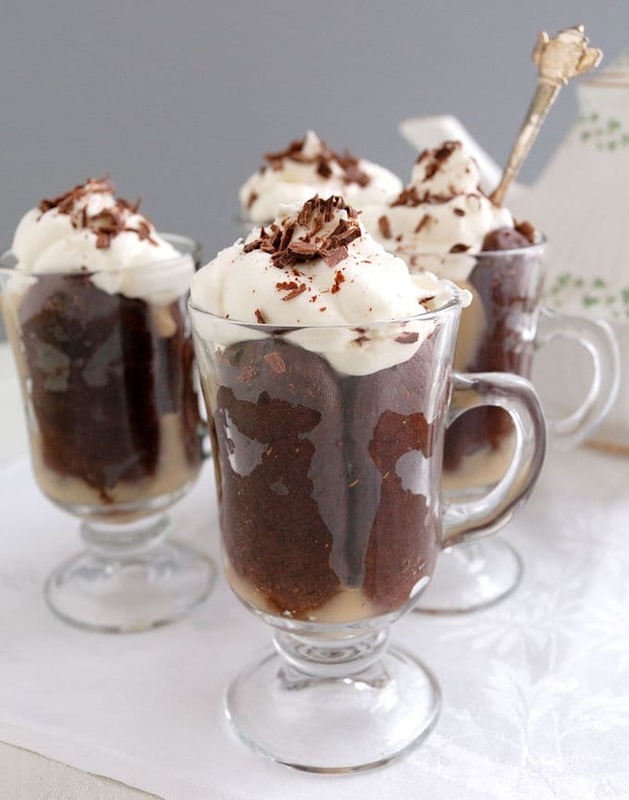 The classic Irish Coffee is turned into a dessert trifle. Preheat oven to 300F. Cover a 1/2 sheet pan with parchment paper. Do not grease the paper. Whip the egg whites until soft peaks are formed. Slowly add powdered sugar and whip to firm peaks. Set aside. Lightly beat the yolks with the vanilla and fold into the egg whites until combined. Mix together the flour and the cocoa. Sift the flour/cocoa mixture over the egg whites and fold in gently just until fully incorporated. Put the batter into a pastry bag fitted with a plain round tip. Pipe the batter into 4" long "fingers". Bake about 10 minutes until the surface springs back when lightly touched. Whisk the eggs, yolks and corn starch together in a medium bowl. 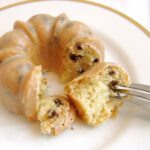 Combine the coffee and milk with the sugar in a medium sauce pan. Cook over medium heat until the mixture gets very hot, but is not boiling. Take the pot off the heat and, whisking constantly, pour the milk mixture in a steady stream into the egg mixture. Return the mixture to the pot over low heat. Stir constantly with a wooden spoon or silicone spatula, making sure to scrape the entire bottom and corners of the pan so the custard doesn't burn. Just before the mixture boils you'll find that it begins to thicken. Cook until the mixture is barely boiling and the custard has thickened to the consistency of a soft paste. Return the cooked custard to the bowl that the eggs were in and add the butter, vanilla and whiskey immediately. Whisk gently until the butter is melted and the custard is smooth. Cover with plastic wrap and refrigerate until fully cooled. Combine the coffee and 3 tablespoons of sugar in a small saucepan and cook over medium high heat just until the sugar is melted. Remove from heat, cool to room temperature and add the whiskey. Whip the cream with sugar to taste. 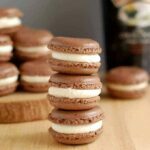 Quickly dip each ladyfinger into the syrup and line the serving dish with a layer of cookies. If you're using a cup you can break up the ladyfingers to fit the shape of the cup. When using a trifle bowl I like to arrange the cookies standing up around the bowl for a pretty presentation. Add a layer of pastry cream. Add another layer of ladyfingers with syrup. Add another layer of pastry cream. 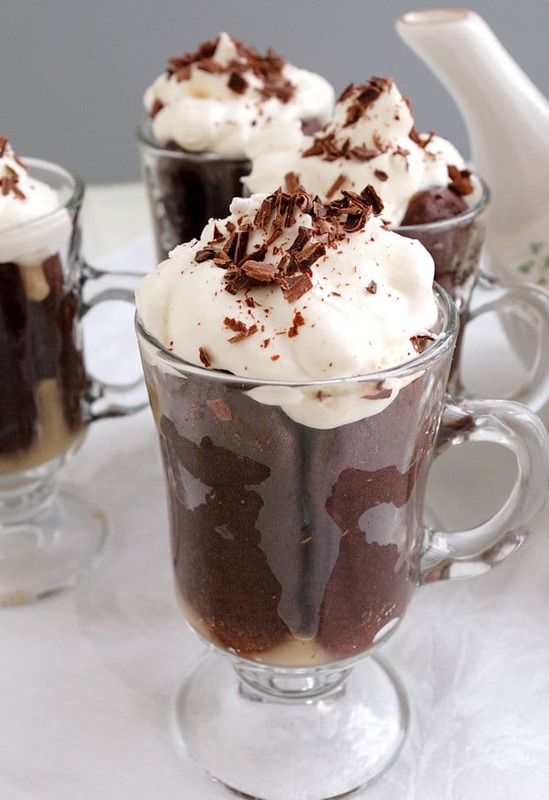 Top with whipped cream and decorate with chocolate shavings. 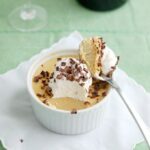 Use the extra yolks from the ladyfingers for the pastry cream. 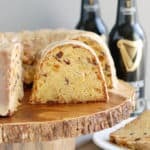 I use Jameson's Irish Whiskey for this recipe. Disposable pastry bags are available at craft stores and anywhere you buy cake decorating supplies. To Make Chocolate Shavings: Take a bar of bittersweet chocolate (I like Ghiardelli 72%) and using a potato peeler, shave chocolate off the short end of the bar onto a plate. 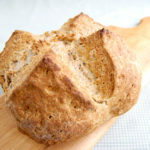 Previous Post: « Is good baking a talent, a skill, or just a matter of following a recipe?